By Chris Williams: WBA/WBC welterweight champion Floyd Mayweather Jr (47-0, 26 KOs) says he’s thinking about extending his current contract with Showtime, according to Fighthype. Mayweather is down to his last two fights of his 6-fight contract with Showtime/CBS, and if he were to extend his contract for another 4-6 fights, he would wind up making a massive amount of money to go along with his estimated net worth of $250 million. Mayweather could bring his net worth to half a billion if he extends with a long-term contract. Even a short term contract would bring him big bank with the right fights against the right opponents such as Saul “Canelo” Alvarez and Miguel Cotto. “Even though I only have two fights left, you know, some days I think about signing a new contract and extending [with Showtime]. I’m thinking about it. I’m not 100 percent sure, but I’m thinking about it,” Mayweather said to Fighthype.com. Mayweather has impressed in the four fights he’s had with his Showtime contract with two wins over Marcos Maidana as well as victories over Canelo and Robert Guerrero. Mayweather has two important fights left on his existing contract with Showtime, and once he gets those fights out of the way then he can start thinking about extending. 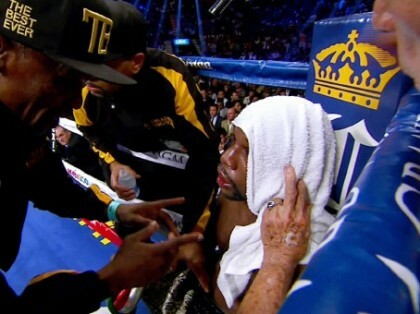 Mayweather just needs to finish his existing contract with the right fights. Mayweather’s next fight will be in May of 2015, and he’s going to need a fairly big name to dissuade Canelo from fighting on the same date as him. Canelo is hoping to get a fight against Cotto, but there’s a good chance that fight won’t happen due to the big egos involved. Canelo probably won’t agree to take a smaller 30% cut of the revenue for a fight against Cotto, and I don’t see Cotto agreeing to a 50-50 purse split against the 24-year-old Canelo due to him having much more experience as well as being older. The chances are high that fight doesn’t happen. Mayweather can then scoop up one of those two fighters for his May date. Mayweather’s September fight can be against either Canelo or Cotto or possibly Danny Garcia if Al Haymon agrees to let him take a fight against Mayweather.